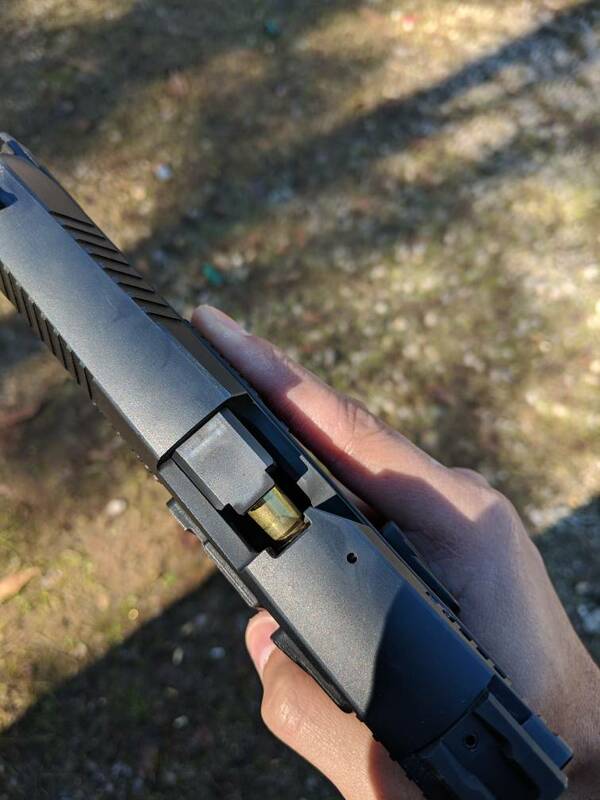 When loading my P09 the first round sometimes does not feed. I have no feeding problems when firing, this only happens when loading. 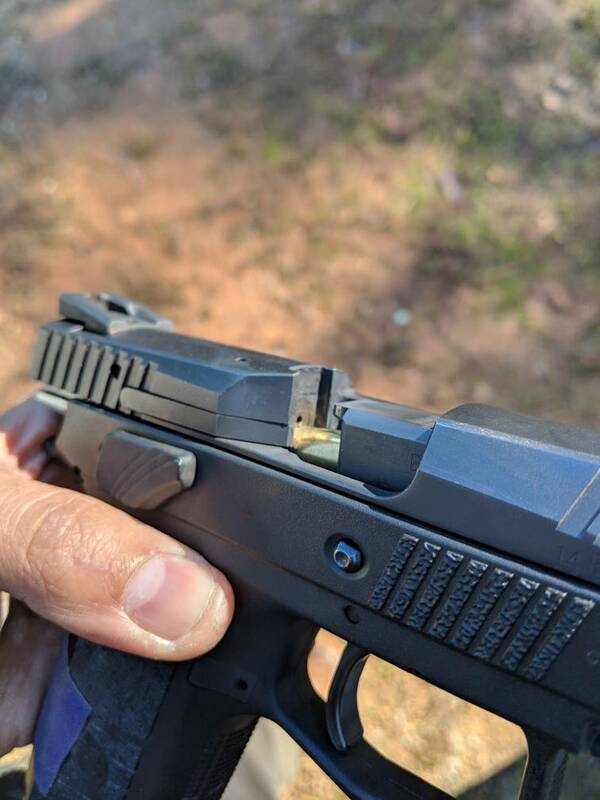 Happens when using the slide lock and sling shotting the slide. It happens with a stock recoil spring and with a 15lb recoil spring. I have 6 mags and it happens randomly with each one. And sometimes if I push the slide forward with both my thumbs it will load in. But sometimes it won't. Not sure if it is related but I had issues on occasion with the edge of the casing getting caught on the front of the feed ramp. Maybe it’s the lighting, but it looks like you might need a little more taper crimp? 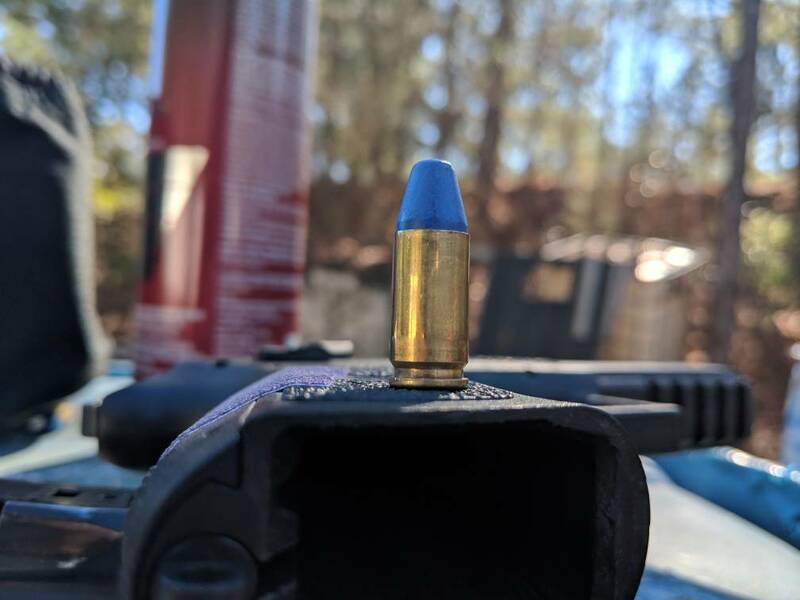 Have you tried different shaped bullets? I haven't used another shape bullet. I've gone through about 6,000 of these 135TC blue bullets. Buy a box of quality factory loaded ammo and see how that functions. If no malfunctions look back to you reloads. Something may have gone amiss there. Having the issue when chambering actually does make some sense. I'd say recoil cycles the gun more forcefully than most do by hand. How many rounds in the magazine? 19? or less? If it's a fully loaded magazine and it hangs at 19 rounds, have you tried loading one or two less and seeing if it hangs up like that? 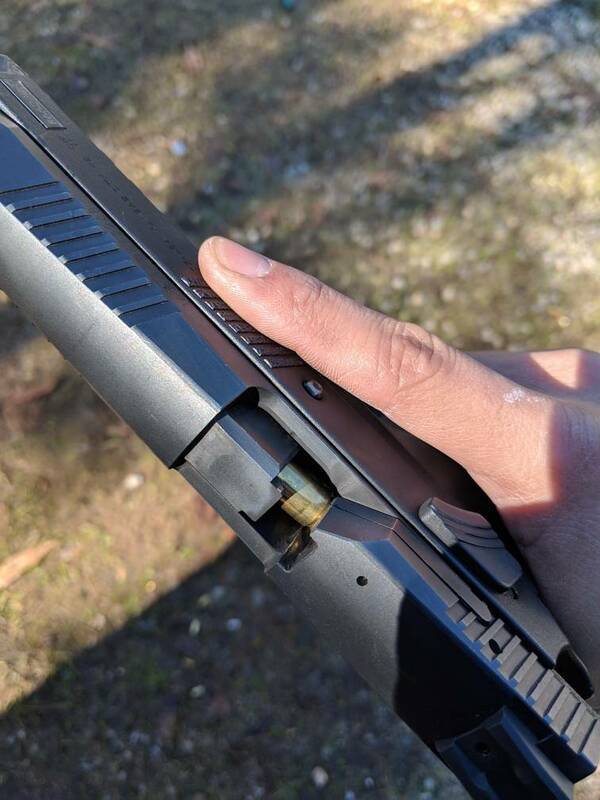 Not suggesting you load down on the magazine, just that a full magazine creates a lot more pressure/friction with that first/top round on the feed lips and the second round in the magazine. 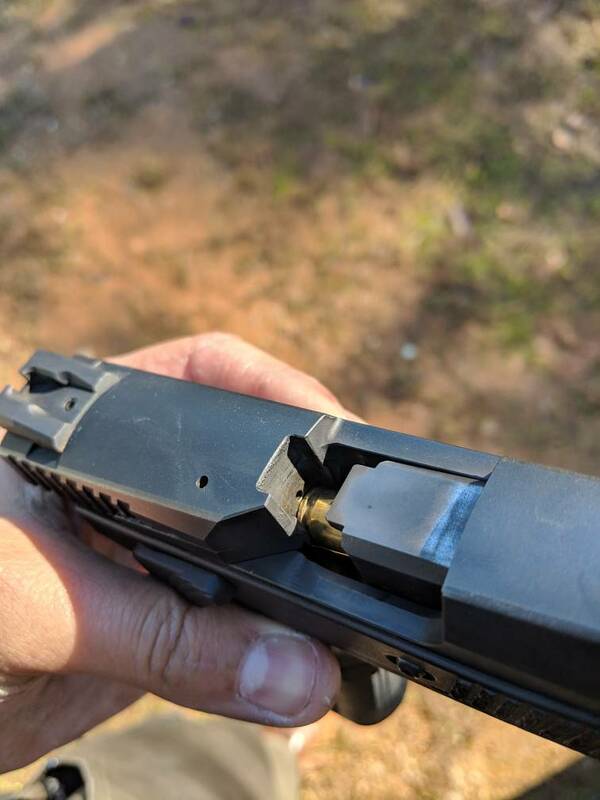 If loading down on the magazine by a round or two "fixes" it you might look at disassembling a magazine and polishing the inside of the lips just a little right there at the top. And cleaning the breechface real good. Some solvent, a brush and some patches and just scrub it till it's good and clean. I was thinking the same thing about the crimp in the second pic, it looks like you haven't quite ironed out the mouth bell, a little more crimp might be the answer. I was also wondering about OAL, hard to say just by looking, but they look kind of long. Good luck, and keep us posted. Later. Maybe it’s the lighting, but it looks like you might need a little more roll crimp? 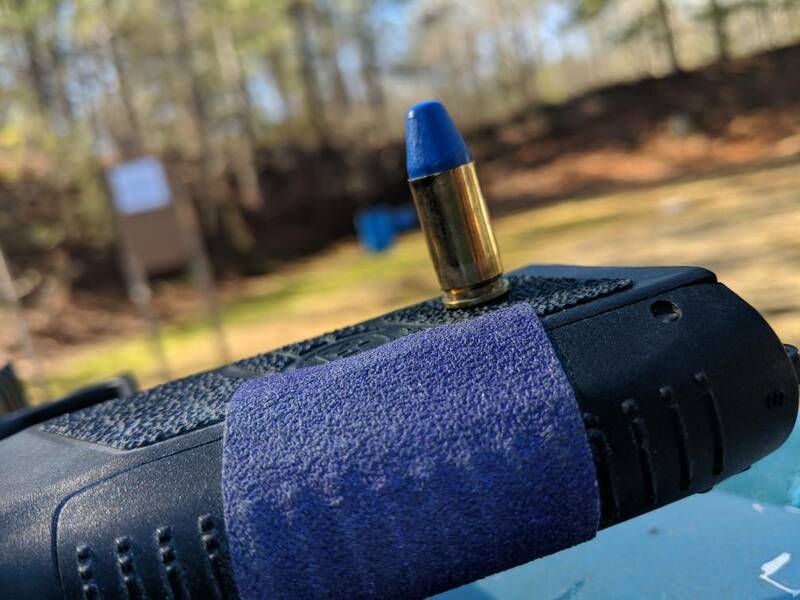 Have you tried different shaped bullets? I was thinking the same thing (well, almost, that should be taper, not roll crimp), in the second pic, it looks like you haven't quite ironed out the mouth bell, a little more crimp might be the answer. I was also wondering about OAL, hard to say just by looking, but they look kind of long. Good luck, and keep us posted. Later. On all of my new 9mms, I always polish the breech face, the feed ramp and the inside top of the chamber. I don't go crazy, I just use a little Imprez diamond polish mixed with a little oil, on the end of a bamboo skewer that is flattened and rounded over a little. This may be frowned upon by some but to me, it's just accelerating the wear you'd see by normal use. After doing this, with factory loads, I can literally baby the slide home and it will feed a round. Of course, again, this is with factory loads. I always polish by hand and polish in the line of draw with respect to the two moving parts. IF you do this, just make sure you don't get any polishing compound in the firing pin hole. My guess is the high shoulder of that bullet. Very nice pics. Thank you for that.